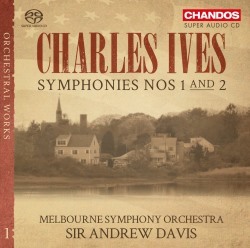 A new Ives symphony cycle is long overdue, so I wasted no time downloading this first volume in a projected series from the Melbourne SO and their chief conductor since 2013, Sir Andrew Davis. I last heard this band in a collection of Bartók pieces under Edward Gardner, that included a superb Miraculous Mandarin suite (review). Gardner is now principal conductor of the Bergen Philharmonic, with whom Davis recently recorded a truly memorable set of Berlioz overtures; indeed, it was on my shortlist of MusicWeb International Recordings of the Year for 2013 (review). Davis’s fondness for English music is well known, yet I remember a very fine Mahler Resurrection at the BBC Proms a number of years ago, not to mention a spirited account of the Saint-Saëns ‘Organ’ Symphony with Simon Preston at the Festival Hall before that. He’s one of those good-natured and tireless conductors who seldom fails to please; occasionally he does more than that, as two off-air recordings of Ives’s Second and Fourth Symphonies attest. Recorded live at the Barbican in 1996 these BBCSO performances mark him out as a sympathetic and insightful Ivesian; indeed, that Fourth – complete with mournful theremin in the finale – is the most convincing and coherent account of the piece that I’ve ever heard. All of which augurs very well for this new Chandos cycle. That said, Davis faces formidable competition from the likes of Andrew Litton and the Dallas Symphony on Hyperion, Michael Tilson Thomas and the Chicago SO/Concertgebouw on Sony, Leonard Bernstein and the NYPO on Sony and DG, and James Sinclair and Kenneth Schermerhorn on Naxos. I’ve always regretted not acquiring the Sinclair/Yale Symphony recording of the Second, which only had a very limited release. Perhaps some enterprising soul will find a way to reissue this performance; by all accounts it’s an unmissable account of a great American symphony (see Postscript). Let’s start with Davis’s Melbourne First. The delightful, airborne tune that threads its way through the opening movement is certainly well sprung, although Tilson Thomas and Litton both add extra warmth and affection to the mix. Davis is steady – measured, even – and while he brings out much of the score’s telling detail and gentle interplays his comparative lack of spontaneity is a real surprise. The recording isn’t particularly full or immediate – the rich, resonant sound that Sony and Hyperion supply for MTT and Litton respectively is in a class of its own – and the Melbourne SO aren’t always as alert as they were on that Bartók disc. The hymn-like Adagio that follows is nicely done, and Davis draws some wonderfully hushed playing from his band. Sinclair is less refined here, but his reading – with the National Symphony Orchestra of Ireland – has a certain earthiness that appeals. However, it’s MTT and Litton who really catch the spirit of this open-hearted score, which the Chicagoans in particular play with a radiance that few can match, let alone surpass. That said, Davis builds and shapes this movement very well indeed, its chest-swelling moments balanced by reposeful passages of rare beauty and line. The skittish Scherzo is probably the best part of Davis’s Ives No. 1. Clarity and momentum are in happy equilibrium, and here the Melbourne players do respond well to Davis’s meticulous direction. Perhaps that’s the problem; even at its best this performance is just too careful, and that hobbles Ives’s sprightlier inventions. Sinclair is much less inhibited, and the close, rather bright Naxos recording brings out all the music’s detail, colour and edge. His rhythms are more sharply pointed as well, and his general progress is more rousing and robust. Davis seems rather pale and flaccid by comparison. That same restraint is carried over to Davis’s finale, which sounds so damn polite, so English, alongside the energy and elan that Litton, Sinclair and MTT articulate with such ease. True, this is an early opus, but in Litton’s hands especially the First Symphony is already looking forward to the complex and distinctive sound-world that we know from the composer’s later works. It’s a matter of sonorities too, and of the three versions compared here it’s the big, bold Chicago sound that has the ring of authenticity about it. As if aware they need to up their game Davis and his band are splendid in the feisty finale. So, not an auspicious start, although if you’re that way inclined really cranking up the volume gives the performance some much-needed oomph. Sinclair, MTT and Litton have plenty of that, and all at sensible levels. More important, all three performances combine that marvellous sense of broad vistas and tall cities that one associates with so much American music of the past century. Pushed to choose I’d pick MTT, not least because he has the finest orchestra and good sonics, although Litton and the Dallas Symphony are very, very close behind. If you must have this symphony on SACD the latter's account – coupled with a decent Fourth - is self-recommending. Leonard Bernstein and the New York Philharmonic premiered Ives’s Second Symphony on 22 February 1951, and went on to record it for CBS in 1958. Lenny revisited the piece for DG many years later, but despite good modern engineering and some delectable fillers this version doesn’t have the proselytizing zeal of the earlier one. Listening to the CBS Second – which still sounds remarkable for its age – I was struck anew by the urgency and insight of the performance. Lenny became irritatingly self-indulgent in his later recordings, but there’s little sign of that here. The NYPO of the period are lively and idiomatic too. After all that volatility Kenneth Schermerhorn and the Nashville Symphony (Naxos) may seem strait-laced by comparison. The upside – if there is one – is that we‘re confronted with a surprisingly elegant view of this tousled score; even those popular tunes don’t leap out of the mix as gaudily as they do with Bernstein. Happily he eschews the exaggerated final splurge favoured by Bernstein and Litton; that said, the latter's performance of the Second Symphony is magnificent in its pace and weight. His Adagio is as cantabile as you could wish, the Dallas brass excel themselves and the recording is well up to the stndards of the house. Davis’s live 1996 account of the Second Symphony comes a creditable third after Lenny and Litton. The BBC strings dig deep in the first movement and there’s an alacrity and sense of purpose here that I like very much indeed. Davis also rises to the big moments with barely concealed relish, leaving one in no doubt that these are the musings of a true musical maverick. Davis and his British band certainly challenge the notion that the best performances of this piece are the autochthonous ones, especially in that glorious mélange of a finale. The enthusiastic applause says it all. Fast forward to Melbourne 18 years later and the start to the Andante signals an altogether less animated and adventurous reading of this extrovert work. As recorded the Australian orchestra don’t have much shape or presence; that matters less in the quieter moments, but it does make the louder ones seem undernourished. True, Davis Mk 2 underlines the sheer beauty of Ives’s writing, which is to be welcomed; however, that's not enough for those of us who prefer boisterous character to polite circumspection. This is a most frustrating performance; even a finely poised Adagio – there’s some lovely playing from the Melbournians – can’t atone for what is otherwise a rather wan, somewhat lethargic account of this symphony. Yes, there is more lift and sparkle in the finale, but it’s too little too late. The overpowering bass drum at the end caught me by surprise, too. No, Davis Mk 1 is in another league altogether; perhaps the BBC will see fit to release that Second and Fourth, as they would be a splendid additions to the Ives discography. In the meantime Bernstein Mk 1 and Litton are still my first choices for the Second Symphony. Tilson Thomas’s version with the Concertgebouw fails to make the cut, as it's rather mannered and the sound is disappointing; that said, his Chicago First remains my favourite recording of that work. Overall Litton's cycle is probably the most consistent and rewarding one in the catalogue; indeed, I'd suggest his recorded Ives is the best thing he’s ever done. On a slightly different tack, I’m a little concerned that The Classical Shop’s website isn’t as reliable or as robust as it once was. I've had rather too many problems recently, with some tracks refusing to download; also, the zip option doesn't seem to work for me. Thus far Davis’s Melbourne cycle is uncompetitive; his live London performances show him to be a doughtier, more defiant Ivesian than this. I'm delighted to report that the elusive Sinclair/Yale SO recording of Ives's Second Symphony is available as a download or CD here.